Planning an adventure? The new Jeep Wrangler Hard Top SUV makes driving up to the mountains with the roof down a piece of cake. A heroic, mini adventurer on rougher terrain, it’s less capable on-road. But it remains an iconic car that’s hard to beat for what it can do in the mud. And it continues to be iconic, despite Jeep bringing it (presumably kicking and screaming!) into the twenty-first century. It still looks classically like a Wrangler, it’s still as uncomfortable as a wrangler (damn), and its interior quality is still questionable! But if your plan is to escape to the mountains, the woodlands and the jungles, it’s well worth a test drive. Even better, it’s a convertible! Perfect for those stuffy days when you need to cool down in exotic places. 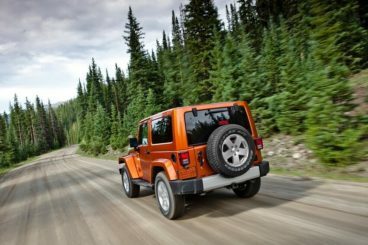 OSV takes a closer look to see what it’s all about with our 2017 Jeep Wrangler Hard Top SUV review. Either that, or just plain bad-mannered. That said, it’s a joy on rough terrain. Its soft suspension means it can clamber over rocky surfaces with ease, and its selectable four-wheel-drive system keeps the momentum up at crawling speeds. It’s even agile, especially if you choose the two-door variant. Its short overhangs, at the rear and front, contribute to this. Differential locks for the axles provide extra grip, while the engines have enough pulling power to haul you out of a jam. Speaking of the engines, a 2.8-litre diesel engine is surprisingly quick. It delivers up to 197bhp, and can get you from rest to 62mph in just 10.6 seconds. That’s not at all bad for such a rugged off-roader. However, this four-cylinder engine sure is a noisy one. It’s big and it’s brash. Not only is it loud, but it also needs to be worked hard, thanks to its 5-speed automatic transmission. You can specify a manual ‘box if you opt for the 3.6-litre petrol engine instead. This power plant has to be specially ordered, but it’s got bags of pace. It produces up to 280bhp, which is enough to launch you from 0-62 in 8.1 seconds. That’s rapid, and it actually feels even quicker. However, since the Wrangler is more suited to challenging surfaces, it’s hard to imagine how many times you’ll need that burst of speed. After all, the soft suspension hardly inspires you to tackle a corner with gusto when it causes so much body lean. Indeed, driving the Wrangler is at times a cagey experience, one where you need all your wits about you. It’s easy to get the impression that they reserved a huge chunk of the budget for its off-road prowess. They certainly haven’t thrown money at the interior. The cabin feels cheap, and it’s not the comfiest place to spend your time. The loud diesel engine doesn’t help. It’s not the kind of engine that barks and hisses at startup before settling down – it’s consistently noisy. The unsettled suspension further undermines comfort. However, it’s worth pointing out that insulation is good for the most part. Only murmurings of wind noise – even at motorway speeds – creep into the cabin. Most buyers probably wouldn’t have such a problem with the car’s rough and ready interior if it wasn’t so expensive. But you’re essentially paying as much as a BMW 3 Series for a capable off-roader. Because despite all that money, the interior you get just doesn’t cut it. The poor quality plastics are underwhelming, while the simple design of the dash is uninspiring. The best thing we can say about the dashboard is that it’s at least easy to use – with the exception of the infotainment system. It’s just too fiddly, and hardly what you need when you’re raising hell in the jungle. The seats are another criticism. All of them are unsupportive and uncomfortable, and space is tight. Even the driver will feel squashed. Worse still, you sit bolt upright, and aren’t allowed to get into your preferred driving position. In terms of how practical it is, there isn’t much good we can say. And that’s a big problem. While these cars are generally sold to people who live a certain lifestyle, it’s much harder to sell them when they’re not very usable. Still, it has party tricks up its sleeve, and one of them is its removable hard top. Removing the roof requires two people, and once it’s off you’ll need somewhere to put it. But once it’s off, you’re free to enjoy the cool breeze. Elsewhere, interior space is a bit of an issue. The cabin is narrow, which means that it’s easy for everyone to feel cramped. The upright seats don’t help with this, and there is scant legroom. But how practical the car is will depend on which version you go for. Opt for the four-door and you’ll have an easier life. With the two-door version, accessing the rear is tricky. The four-door variant is also 523mm longer, which means you have more legroom. Storage space is decent, and includes a positively gargantuan glove compartment. The boot, meanwhile, measures 498-litres in the four-door model. That’s decent, but far from class best. It’s not so easy to access either, as you have to get to it from a split-opening side-hinged back door. Opt for the two-door model, and you get a measly 142-litre boot. Standard equipment is one of the car’s strengths. Each model gets automatic headlamps, climate control, an Alpine Audio system, and Hill Descent Control. They also get 18” alloys, and tubular side steps. Impressive. 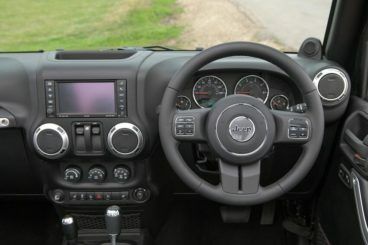 The Overland Models get a decent 6.5” touchscreen infotainment system that comes with sat nav. It also sees its hardtop sexed-up with the addition of a “Freedom Top.” It’s a body-coloured 3-piece. The Rubicon Model gets more off-road prowess. It’s tougher than the other models, with its extra protective underbody helping to this end. We can’t gauge exactly how safe the Wrangler is until Euro NCAP crash test it. At the present moment, there doesn’t seem to be any concrete plans to do so. What we can say is that its standard safety kit include electronic stability control and airbags. It also includes a rollover protection system, and antilock brakes. It’s all mandatory stuff that you’ll see in rivals, too. Prices for the new car start out from £37,750 and rise to £40,500. If you want to lease the car, you can pick up a deal from as little as £452. For more information on our leasing deals, you can check out our page here. In terms of its running costs, the Wrangler’s cheapest-to-run engine returns 34.9mpg. That’s not fantastic, and it can only do this as a three-door model. Tax, meanwhile, is £295. The petrol engine is staggeringly more expensive, and will set you back £515 per year in road tax. The economy is just 25mpg. We haven’t compared the Wrangler to rivals in our review because it’s in a niche of its own. But if we were to compare it, the economy would not be in its favour. In fact, we could compare the Wrangler with a Ferrari California and the California will come out on top. Worse still, the Jeep doesn’t hold onto its value at all well over three years. It’s hard to describe its off-road ability. It’s one of those things where you really need to experience it to believe it. Definitely one for off-road, rough and tumble enthusiasm. We love how it looks rough and ready to get dirty. It doesn’t look mean as such, but you can see it’s ready for anything you can throw at it. The Wrangler has proved popular with Californian’s who want to drive up to the mountains. And with its removable hard-top, it’s a lot easier to take the Wrangler out on sun-kissed days and enjoy the rays. With best returns of 34.9mpg, all we can say is just make sure you don’t stray too far into the woods. And if you must, always take a canister of fuel with you! The Wrangler is much better off-road than on it, and we’d wager a lot of you can’t wait to get out there. But mixing it among Britain’s mud and slime means it will wear down quickly. This means you’ll need to service it more than usual, which won’t be cheap. The Wrangler enjoyed its 75th-anniversary last year, so it’s clearly doing something right. In 2017, when people still want to have lots of uninhibited fun off-road, it’s just as relevant as ever. Sure, it has its deficiencies. But its grip, Four-wheel-drive and rugged good looks contribute to an unequalled off-road driving experience. It’s possibly one for diehards only. But everyone will be jealous when you rock up to the mountains with ease in what is essentially a convertible Jeep Wrangler Hard Top SUV. Jeep Wranglers are exceptional SUVs, I love ‘em. And it’s even greater that it smoothly tackles the wind noise even at the motorway speeds. My Cabrio was overwhelming at reining in these bogeys that I had to finally mount a good wind deflector. Thanks to the Backblade windscreen now my cabin is super-quiet.